How enjoyably exciting it seemed when Bruce Willis, after chilling moments of suspense, managed to outwit the terrorists in 'Die Hard' and release the hostages. It was not a hotel that was taken over by the terrorists, but a couple of floors or more in a high rise building in Los Angeles. 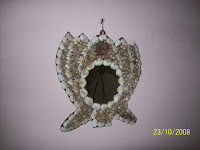 But what happened in Mumbai at the Taj Hotel and the Oberoi Trident in the last few days did not thrill me in the least. We were glued to the TV, watching live action of the hostage terror and it wasn’t in the least enjoyable or exciting. Ball by ball commentary, so to speak, with visuals of what was happening on practically all the news channels only left us desolated. The feelings we were left with were grief and rage for all the lives lost in the attack, and fear for the lives that were at risk in the act of rescuing those who were still alive in there. The commandos and the police did a fine job, and lost some precious lives from their units in the process. The depression caused by these events was matched by what one could call the pathetic fallacy of nature, with the skies weeping in Chennai and other places in Tamilnadu, when it just kept raining relentlessly during the whole 60 to 70 hours of the terror activity in Mumbai. As the siege ended, and the commandos took charge, the rains abated. 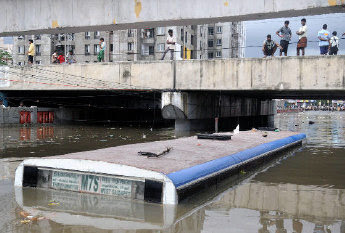 Lives have been lost in the heavy rains caused by a cyclone, (named Nisha), and untold damage has been caused by rainwaters entering homes, both in the city and the interiors. The temple town of Chidambaram, we understand, became marooned. But, to use a cliché, the human spirit is resilient and people will go back to their normal lives in Mumbai and elsewhere, but the lives of those touched by this tragedy personally, and who lost loved ones, will never be the same again. OFF WITH THE OLD. . . . .
Sms-s, emails, phone calls, the whole works. Day in and day out. But my reaction is silence, an impassive silence, while I rub my hands together in glee. When I needed your help, you never paid me the slightest attention, ignored my phone calls, and sent me vacuous emails full of no information. Now you beg and persuade, plead and beseech me to renew my association with you. I have found someone new, who is just perfect for me. BSNL - my new service provider. No more waits of up to seven days while cable problems (which were as frequent as once a month) were sorted out. No more of having to talk to courteous, yet indifferent, call centre employees, who insisted on being civil, full of empty politeness, but were of no help at all. No more calling them up and not getting any feedback. I only have to open the Internet, and there I am connected immediately and am ready to surf. Or so I thought . . . . When suddenly two days ago I found that I could not connect to the net. I called their Call Centre. The line was busy for very long, and I could not get through at once. But once I did, the person there, without being obsequious, very clearly told me (without any ornamental flourish - no ‘have a great day’, no ‘thanks for calling us’)that my problem would be addressed as soon as possible. When I called the person who had come home to connect us to the service, he said he would come to check the lines. But before the appointed time he called to say exactly what the problem was. It was a major one, with the server being down, and so he would not be visiting since it was not a problem related to our line. I appreciated that service. The connection was restored without much delay the same day. A nice change. The next day the newspapers reported a major snag in the BSNL service, which had disrupted connections state wide. I am happy now, though I realise that if our telephone lines go, so would the broadband connection. But I am prepared to take that chance. Well - preserved, a friend remarked of my house and me, and in that order. I was flattered, even if I did sound like a jar of pickles. My hair has thinned, and my waist has thickened, but I wasn’t too bad, I thought. 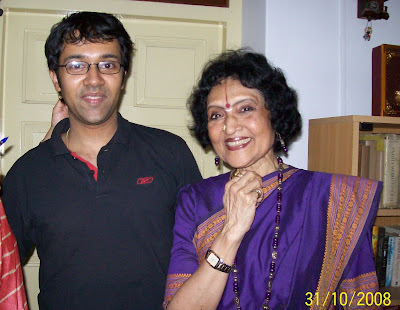 Her words reminded me of a recent meeting with actor Vyjayanthimala. Now here is a person who has aged gracefully and wears her years with élan. And not a bit of fat anywhere. She is so trim and slim, and that lovely smile from her ‘Madhumati’ days is intact. 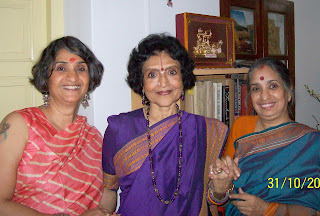 My sister Viji had met Vyjayanthimala in Mumbai earlier this year, and called her when she came to Chennai recently. Vyjayanthimala immediately invited her to her place for dinner. After dinner she dropped Viji back - and came in to meet my mother. Viji said later that she had just asked her, “Will you come and meet my mother?” and she had immediately agreed. 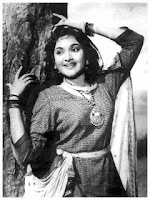 When Vyjayanthimala was in her prime I was rather young (I think I was about eight when I saw ‘Nagin’) and was totally captivated by her. She was beautiful and graceful, and had the most charming smile. She remained my favourite heroine for very long, till after ‘Sangam’. I still feel that no heroine of today – size 0 or not - can hold a candle to her when she was at her best. 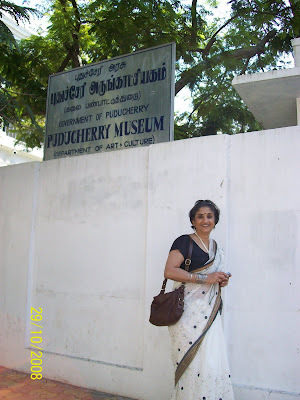 She did not do many Thamizh pictures, but those she did were great. Her dance with Padmini in ‘Vanchikottai Valiban’ remains one of the screen classics ever. She ruled over the Hindi screen with the great heroes she costarred with – Kishore Kumar and Pradeep Kumar earlier, and then Dev Anand, Dilip Kumar and Raj Kapoor. 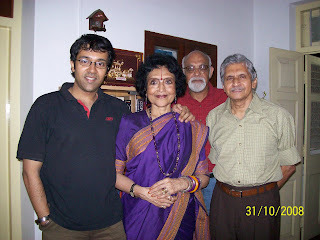 So when Viji called and said that Vyjayanthimala would be coming home, I was excited. Quickly changing into a more presentable saree (I had already got into my nightwear), and patting my hair into place, I went downstairs to receive her. 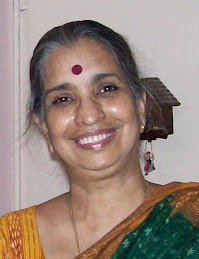 I opened the gate when the car came and she, sitting next to her son in the front, put out her hand, and said, “Rajalakshmi (my full name,) can you please hold the gate open?” I was disarmed. That set the tone for the rest of the visit. She was all charm and grace, and we relaxed, and told her how she, among others, had filled our thoughts of films and film actors. When I asked if we could take pictures, she immediately agreed and got up telling my mother to keep sitting, and stood behind her chair and posed (see picture at the top). Several clicks later, we were back to chatting, and she told us about the dance programme she is presenting this music season. At 70 plus, she is still thinking up new themes and rehearsing rigorously. No wonder she is so slim. When my mother mentioned that my birthday is on the same day as hers, she appeared delighted, and shook hands with me all over again. Now, I can understand my being delighted, but her? There was no need for her to appear so. That, I suppose, is the secret of her charm. Incidentally, she lives barely 5 minutes away from us on C. P. Ramaswamy Road. She was amazed that we were practically neighbours, and had been so for the last 40 years. My husband, thinking this an opportune moment, mentioned to her the overburdened condition of our road, and asked her what she could do, as a former MP of the locality. Suchindra, her son commented that they were also victims of the weird road rules – he had no direct access to their home from the main road. Granted, that I am not the star struck teenager of the 60s, nor she the reigning queen of the silver screen today. In spite of that, she bowled us over with her matter-of-fact manner and total lack of airs. My mother remembers her from an earlier occasion too as a nice person. 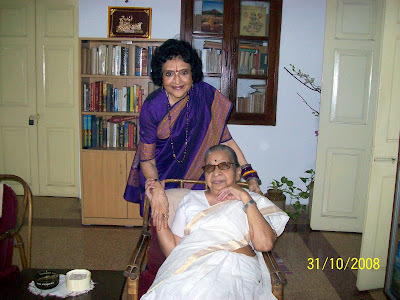 At the investiture ceremony at Rashtrapathi Bhavan, New Delhi, in the 1970s, when my mother and her sister had accompanied my father to see people receive their Padma Shri and other awards, my aunt had gone up to Vyjayanthimala and asked if she could hug her. And the star had easily agreed and hugged her back. I will never dream about Pondicherry again. I have had my heart’s fill of it now. 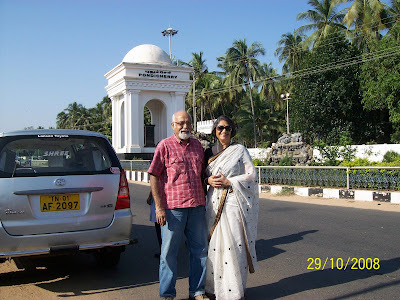 Going back to Pondicherry after 46 years (we left there in 1962) with my sister and her husband (see picture above) who were visiting from Bombay, was the most rewarding experience. 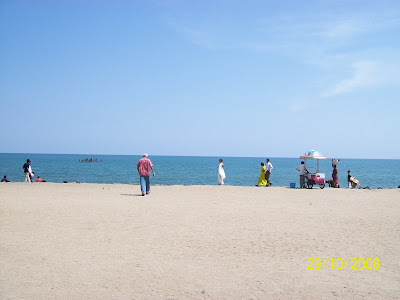 Though I have lived in Chennai for the last 41 years, the opportunity to visit Pondicherry had never arisen, though it is just three hours away. And I never felt the need to go, but would dream about the place. About the house we lived in, the school we went to and our days there. I wanted to keep my memories intact, and so never thought of going. My heart was full of happy childhood memories of the place. So many wonderful things had happened there. My youngest sister was born there. We went to the best school possible. We made a lot of road trips to the ultimate city (to us!) 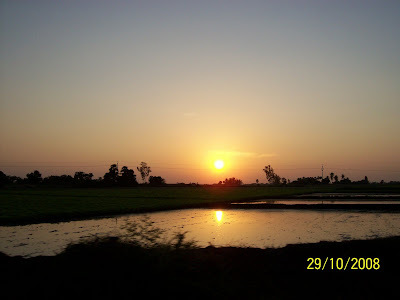 Madras. We learnt French and a bit of French culture, and made so many friends. 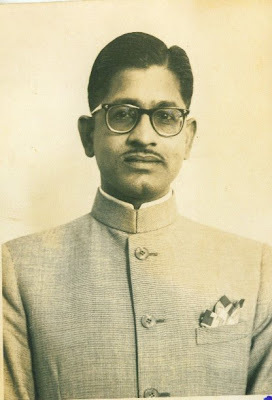 We were there from 1957 to 1962 – a very brief period, when my father(above) was posted there on deputation from New Delhi. He served as the Development Secretary. 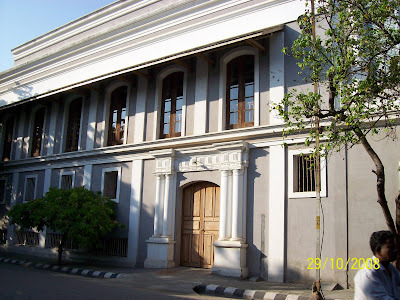 We lived on the top portion of a huge building, next door to what was then known as the Government House, and housed the Governor’s/ Chief Commissioner’s residence and other government offices. And my father had his office downstairs. We were only young children and did not know anything about the takeover of Pondicherry from the French by the Indian Government. All we knew was the predominant French influence and atmosphere in the city. So when Viji called from Bombay and said “Raji, shall we keep our date with Pondicherry?” I was only too happy to say yes. And Viji was the best companion I could have had on that trip. 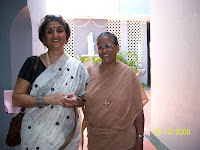 She and I (along with brother Bala) shared the same memories of home and school, though there is about six years difference between us - and nearly six inches! Driving down the ECR in the car hired for the express purpose, we talked and relived those days, fifty years ago! Reaching Pondicherry, we tucked into a delicious breakfast and told the driver to take us to the Government House(on the right). He insisted that that was not one of the sights, but we had our own agenda. He then said he did not know the way. We told him to go to the beach and we would direct him. And happily we could. We were going to see the house we had lived in. The streets were the same, the buildings were the same. The memories came flooding back and we knew exactly where the house was going to be. It was a clear and sunny day, but not too warm, adding to our expectations. We reached where ‘our’ house should have been, and found to our dismay that there was a building housing the Romain Rolland Library close up to the compound wall with the front gate, blocking our view of ‘our’ house. It was like a slap in the face. When we enquired inside we were told that the entrance to our building was on the street alongside, the street separating our house from the Government House. And there we found this board! Our house had become a museum – we are now on par with the Prime Minister Jawaharlal Nehru, whose home has been turned into a museum too, we joked. My mother who had visited Pondicherry a few years ago and been to the house had prepared us for this. In a way it was good, otherwise we would never have been able to see the inside of the place. We went in and asked to see the upstairs. The man at the reception table pulled out three tickets at Rs. 2 each. And while we excitedly told him that we used to live there so many years ago, he pulled back the tickets and waved us in. We insisted on buying the tickets, because as we told him, my father would have been the last person to encourage the misuse of concessions. Going upstairs we found the rooms had become models of the luxurious rooms of the French period, (with suitable furniture and furnishings)– no photographs were allowed to be taken inside. We spent a long time there looking at the rooms and other exhibits, usually found in museums, reliving and revelling in so many memories. As a child I remember the shine my mother maintained on the red floor, but now that sheen was missing. See the shine on the floor! 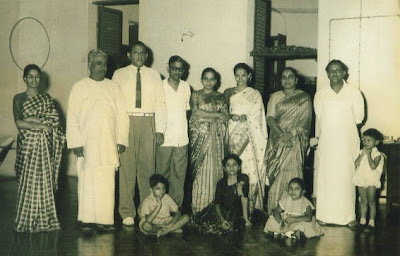 Taken in 1962, when we were leaving Pondicherry for good. We wandered about the huge rooms, and discovered the changes made there – the person-in-charge was very helpful once he also learnt we were ghosts from the past. We went up to the terrace, where we found some more buildings blocking the view of the sea, barely 100 yards from the place. That was sad. From the other side the view was overlooking the Government House, and beautiful it was, just as before. The sky was never bluer, the light never brighter than on that day. From the tiny balcony in front of one of the rooms we could see the road separating the house from the Government House. In the corridors of our memory we heard the reveille being played in front of the Government House – twice every day, once to hoist the flag in the morning, and once in the evening, to lower it. How often had we seen the men marching from somewhere behind the Government House to the front, in their smart khaki uniforms and hats along that road. When we left the house (museum)we were satisfied, warmed by the reception accorded to us once the persons there knew us for past residents. Next on our list was the school. We told the driver to drive slowly while we drank in the sights of the place, the straight and parallel roads, laid at right angles. The Pondicherry we knew and loved was this one square mile city, called the white town, with no public transport, but for hand-pulled rickshaws. We had no truck with the rest of the city, but for visits to the cinema theatres. 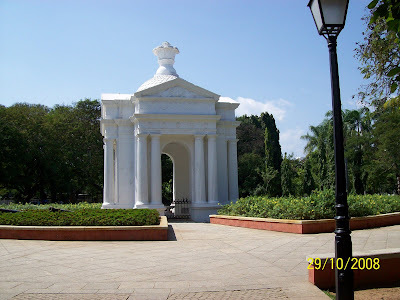 We used to walk to school, barely half a mile away, across the Government park where the lovely Aayi Mandapam is (we did not know then that that is its name). St. Joseph de Cluny High School, run by the Cluny sisters from France held the most important place in my mind then. The Headmistress then was foundress Sr. Peter Claver, a nun who was from Switzerland who we referred to as Mother Peter. She made sure that along with academics we had a well-rounded education with music and art classes and sports. She set up a Literary Society, and the sports day was an annual event to look forward to – just as Parents’ Day was. For the latter she thought up interesting programmes that included Thamizh songs and dances, and also English and French pieces, for which we trained assiduously from weeks ahead. I am sure all schools have the same events, but to me it was special, especially because of Mother Peter’s enthusiasm. Then there was the annual fete, which was open to the public – there were stalls selling wares made by the inmates of the orphanage attached to the convent, and music played incessantly. Packets of confetti (contributed by us cutting the wrappers of sweets and toffees into fine pieces) were sold for four annas – 25 paise - and used to be scattered over everyone, just for fun. That was one day the strict teachers and sisters let all the rules relax, and fun was the keynote. We went looking for the school and found it – in the same place, with the same buildings on either side of the road. But where was the school? Only the Montessori section functions here, and classes for Western music, another legacy from Mother Peter, are being held in what used to be classrooms. The staircase where Bala and I had posed for photographs with friends was still there, though narrowed down. Sister Judith, the sister in charge there gave us the details of the number of music students and the exams they were trained for – Trinity College of London was the examining authority. I remembered that Viji had taken one of these exams. We met Sr. Phyllis, the Principal of the Montessori section, and she told us how the school on account of its growing strength had moved from here to another part of the city – but we already knew this. The newspaper I worked with used to run a sister newspaper called Pondicherry Times, and I got a lot of updates from it. We were touched to see Mother Peter’s picture gracing the place. My brother Raja who was then very young was her favourite. – she used to call him her sweetheart. On the other side of the road - where the French section used to be, along with the sports ground and the hall with its stage – everything was still there, but everything was different. Sister Suzanne who received us told us of the current activities of the school. All the sisters received us so affectionately when they knew the purpose of our visit, even if they did not know us. . . Not a soul whom we knew, or who knew us, did we meet. Fifty years is a long time. Following our own whims, we decided to hit the beach next, but after succumbing to thirst quenchers next door to the school. The restaurant on the first floor had a thatched roof, and the walls had original paintings from Hindu myths, in the style of Ravi Varma. The beach was a favourite haunt in those days, and my father used to take us there regularly; though it was only an itsy bitsy walk, we would go in the car. (I used to hate the beach for some reason, and preferred not to go.) The raised, wide cemented path along the beach, Promenade as it is called appropriately, saw many people after the sun had set. 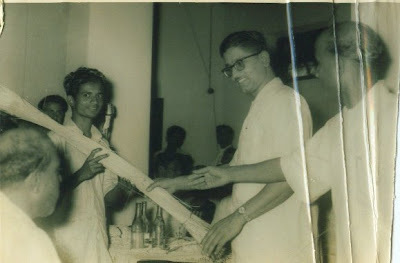 The students of the Medical College – these were pre-Jipmer days - would also come there, as well as the doctors, my father’s colleagues with their families and residents of the Ashram. Walking on the promenade was a popular exercise, with the cool breeze balancing the warm cemented walk with its little wall on which people could sit. One could not reach the sea so easily then. Today it is possible to reach the sea after a walk on the sands. 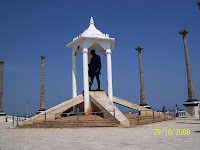 Lord Dupleix’s statue has been move to the farthest part of the beach, from the place of honour, and Gandhi’s statue is put up there. And from the beach it is easy to walk across to the Government Park. The park has been transformed from a plain garden with acacia trees and grass to a tourist spot with flowering shrubs and vague pieces of sculpture, and a corner with swing and other playthings for children. But that lovely arch, where I was once the chief priestess invoking Lord Zeus, remains the same. We went round the park looking at the buildings on the sides – We oohed and aahed “Oh there is the hospital” where Gowri was born, and “There is the Club”, where we used to go regularly, and where my father used to play tennis. It was a treat to be taken to the Cercle (de Pondicherry), as it was known, with him and be treated to dainty sandwiches and lime juice. Viji’s husband Venky remained a mute spectator throughout, silent support coming from him at all points. After a detour for lunch into the other side of town, (the other side of the canal, separating it from the white town) we came back for a last look at ‘our house’, and the streets around it. The buildings here are so beautifully maintained, painted in muted shades of grey. The roads are paved and slope to the sides of the road, where there are outlets for rainwater to drain out. 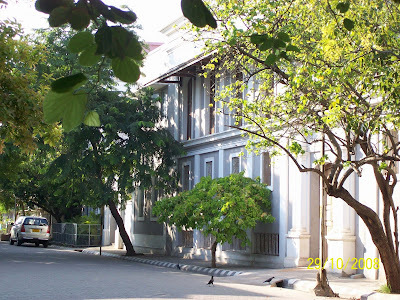 Most of the buildings are owned by Sri Aurobindo Ashram, which is what Pondicherry is most famous for now. One of the buildings is where the Mother used to give darshan from, Viji remembered. As a student there was a healthy rivalry between the Ashram school and ours in inter school events. As a Clunyite, I dutifully hated the Ashram students. 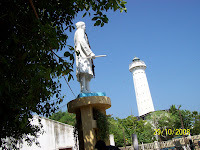 But the fact remains that the Ashram played a huge part in the development of Pondicherry. We also wanted to visit the Pillayar temple which we used to go to regularly - it is so close to where we used to live. 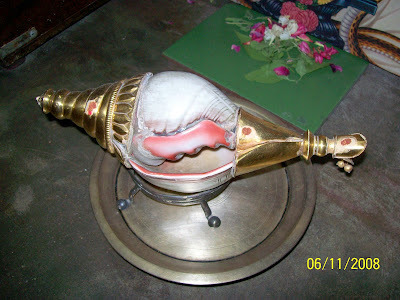 My father never took the car on outside trips without visiting this temple and breaking a coconut. The temple has grown very large now – with land donated by Ashram mother, says a legend in the temple. The little elephant outside the temple was a crowd puller - Lakshmi, a real charmer, with a chain of bells, and anklets round her legs. 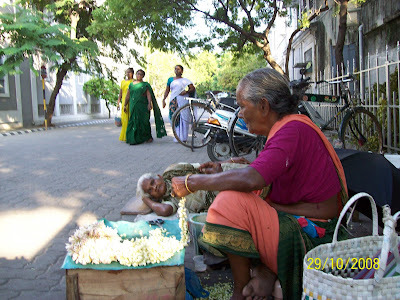 Outside, we saw two women stringing jasmines, and remembered the small packet of stringed jasmines which was delivered to our door every evening, and we would all wear them in our hair, right from Grandmother downwards. It had been a perfect day, and a sense of fulfillment pervaded us, as we drove back home. Our driver suggested we visit the relatively new Sri Anjaneyar Temple at Panchavadi. We did and marvelled at the 36 foot high Hanuman. The road we took was the Trichy road, and a smooth ride it was. All ghosts have been laid to rest. I was waiting at the supermarket cash counter with just two items in my shopping bag. There was only one person ahead of me, and I was content to wait till he finished, though he did have a basketful of groceries. The cashier told him the amount, about Rs. 1200 and a little more, and waited for him to pay. Out came his wallet, but instead of cash, he pulled out a small booklet, which he laid on the counter. Even as I looked on amazed, he opened it, and started tearing out sheet after sheet. The girl looked at one sheet and told him that the value of each sheet was Rs. 15. He nodded, and pulled out about 50 of them, one after another, taking his own time. Then he went on to pull out sheets of the next denomination, Rs. 50, as the girl verified. By now she was confused, and had called her colleague to help calculate. The colleague came armed with a calculator, and while she calculated 50 x15 and wrote it down, the man began to pull out more sheets. Curiosity having got the better of me, (and I was melting in the heat as well, since the air conditioner had broken down in the store) and felt justified in wanting to find out just what was holding me up, I looked at the sheets – they were of Rs. 75 denomination this time. It also said something like ‘sodexho’ and ‘food pass’. I began doing some mental calculations to see how many more sheets of what denominations he would need, when he picked out a Rs. 10 note from his wallet and handed it to the cashier to complete his payment. The man coldly refused, and she ran to the next counter to get change. And all this while I was in line, 12 minutes of watching the transaction, though it seemed like 12 hours. Finally the girl turned to me. Phew! I wondered why they did not have a separate line for people who wanted to tear out their coupons. Coming home I tried to recollect where I had seen the word ‘sodexho’ before. And it came back to me. It was at a restaurant where my young friend had taken me for a treat – it said ‘sodexho’ coupons/passes were not accepted. She had planned to use them to buy our dinner! Fortunately we had some money with us, so we were saved some red faces, and did not end up washing dishes. I wanted to know what this ‘sodexho’ is, and found out the following from another young friend, who gets them. 1.This is given by companies to their employees as food coupons in lieu of a part of their salary to save on tax. You save a nifty sum by the way because sodexho coupons are tax free. I am told most IT (Information Technology) companies go for it. 2 They can be used for buying groceries and food. 3.There are sodexho coupons and passes – the distinction is too fine for me to grasp. 4.Sodexho is a company name standing for Societé d'Exploitation Hotelière. Very good, but maybe they will give coupons in the future in bigger denominations too, so other shoppers’ time can be saved. SHE SELLS SEA SHELLS. . .
. . by the sea shore.’ That old tongue twister used to make me wonder who collected the shells she sold. Today at the beaches one does find people selling seashells – made into dolls, fixed decoratively on mirrors, or just plain chains, and tourists buying them. When we were children, one of the thrills of going to the beach was walking barefoot in the sand, allowing our feet to sink into the warmish, wet sand as deeply as possible and curling our toes. And then walk closer to the waves, skirts lifted right up to the knees and pants rolled up, and let the waves come and wash our feet, while we would retreat squealing with delight, asking for more. 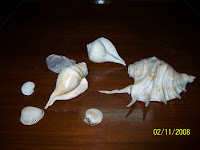 And then there was the pleasure of looking for shells and collecting them, having an impromptu competition amongst ourselves to see who had the most, the prettiest, and so on, as only children’s minds can think up. We never thought about what we would do with all the shells we picked up and carried home, sandy and grainy, but take them home we had to. And empty them into old chocolate tins reserved for the purpose. We did not care after that. But my mother is very resourceful and artistic. She used the shells in a very creative way to show each one off individually. She took small circular boards (like the base of cakes) and heaped loads of wet cement on it forming a tiny hillock, about a foot high. 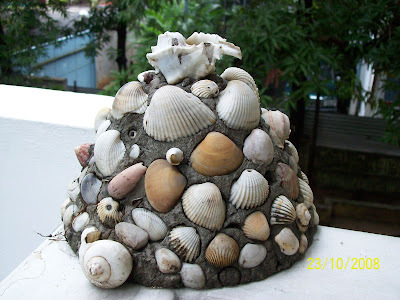 She pressed the cement hard to make it stay firm, and while the cement was half-wet, she pressed the shells into the little mound, with the prettiest one on top. 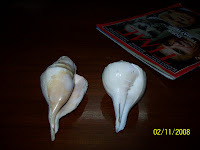 Some were shells her grandmother had collected from Rameswaram. One of them is the conch on top of this mound. I have one she made all those years ago, and to my knowledge she made at least three more. A picture that haunts my mind is the illustration of Rosamunde Pilcher’s ‘The Shell Seekers’. It was in a magazine along with an extract of the novel, but it was so many years ago, and I am not sure which one. 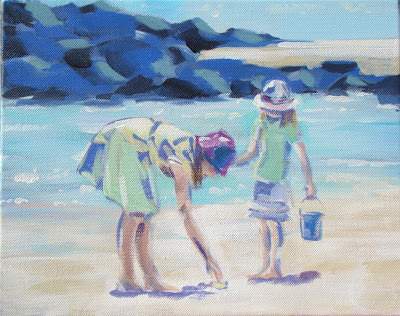 Two little girls on the beach, one stooping to pick up a shell, and the other watching. I was pleased to see a similar picture on the net enititled ‘The Shell Seekers’ – maybe it is the same? It was a pleasant surprise on Sunday morning when I opened my mailbox. 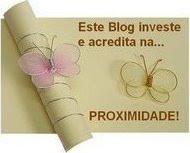 There was a mail redirected from the comment box of my blog. Namaki has presented me with an award ! I quote: ‘Hello Raji ... Let me offer you the Arte y Pico award for your blog ... because I like your stories about Indian culture and traditions etc.” I understand that the award is given to bloggers who are artistic in any way. My most sincere thanks, Namaki. I am happy that my writings tell you a little about our traditions, even though I have not made any conscious effort to specifically talk about them. Now it is my pleasure to offer five people the award. Adi for his beautiful bilingual poems. Sunita for having created a natural garden, which I see through her photographs and complementary writings. Indrani for her wonderful photographs. Flowergirl for writing so interestingly about flora and fauna.